London: Virtue & Company Limited, 1881. Books measure 13 x 10 inches. 5 volumes bound in 4. With the Additional Supplement t '' Social Life in Egypt ''. Illustrated throughout, including steel engraved plates. Complete as index. Bound in period half calf, calf corners, raised bands, gilt tooling. Bindings light rubbed, a few minor scuff wear marks, short crack to a couple of hinge joints, but all bindings holding firm. Internally, some light spotting or foxing, very minor staining along bottom margin of a few plates. Pages and illustrations in very good clean condition. A very nice set, in very attractive bindings. . Very Good. Large Quarto. Kjobenhavn: Reitzels Boog Arvinger, . Øieblikket har numre 1 - 4 i Tredie Oplag er numre 5 - 9 i Andet Oplag.. Slightly rubbed only. A very good+ copy. Nine small tracts issued monthly in which Kierkegaard attacked official Christendom. Kierkegaard had completed a tenth number, which was at the printer's when he died, the text remaining unpublished until appeared in the eighth volume of his Eifterladte Papirer in 1881. . Øieblikket har numre 1 - 4 i Tredie Oplag er numre 5 - 9 i Andet Oplag. Kjobenhavn, Reitzels Boog Arvinger, 1855 8°. 20, 31, 16, 23, 32, 26, 77, 30, 22 pages. Hardcover / Original half leather with gilt lettering on spine. Slightly rubbed only. A very good+ copy. Nine small tracts issued monthly in which Kierkegaard attacked official Christendom. Kierkegaard had completed a tenth number, which was at the printer's when he died, the text remaining unpublished until appeared in the eighth volume of his Eifterladte Papirer in 1881. D. Appleton & Co, 1881-01-01. First Edition. Hardcover. Very Good. 4 volume set. Handsome and crisp. D. Appleton & Co., 1881. Bound in publisher's green cloth, with gold lettering and picturesque tooling on front boards. All edges gilt. Hardcover. Good binding and covers. Ugly scuff on volume 2, else fine. Clean, unmarked pages. Contents: Introduction / by the Very Rev. Dean Stanley --Jerusalem / by Col. Wilson --Bethlehem and the north of Judaea / by the Rev. Canon Tristram --The mountains of Judah and Ephraim / by Lieut. Conder --Samaria and the Plain of Esdraelon / by Miss E. Rogers --Esdraelon and Nazareth / by the Rev. Canon Tristram --Galilee, Northern Galilee, Caesarea Philippi and the highlands of Galilee, Mount Hermon and its temples / by the Rev. Dr. S. Merrill --Damascus / by the Rev. Dr. P. Schaff --Palmyra, The Wady Barada, Ba'albek / by the Rev. S. Jessup. Phoenicia and Lebanon / by the Rev. H.W. Jessup -- The Phoenician plain / by the Rev. Canon Tristram -- Acre, the key of Palestine, Mount Carmel and the river Kishon, Maritime cities and plains of Palestine / by Miss M.E. Rogers -- Lydda and Ramleh, Philistia / By Lt. Col. Warren -- The south country of Judaea / by the Rev. Canon Tristram -- The southern borderland and Dead Sea / by Professor Palmer -- Mount Hor and the cliffs of Edom, The convent of St. Catherine / by Miss M.E. Rogers -- Sinai / by the Rev. C.P. Clarke -- The land of Goshen, Cairo, Memphis, Thebes, Edfu and Philae / by S. Lane-Poole. This is an oversized or heavy book that requires additional postage for international delivery outside of Canada and the US. Histoire des Ariégeois (comté de Foix et vicomté de Couserans) - De l'esprit et de la force intellectuelle et morale dans l'Ariège et les Pyrénées centrales. 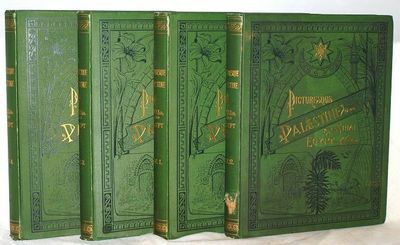 Didier et Cie 1881-1882-1883-1885-1886-1887 Histoire du Comté de Foix, en 4 parties et 7 volumes: 1 / "Les Poètes de l'Ariège" (1er vol. ); 2 / "Les Militaires de l'Ariège": "Les Militaires de l'Ariège, 1ère période, depuis le commencement du Comté de Foix jusqu'à la Révolution française" (2è vol. ), et "Les Militaires de l'Ariège, 2ème période, depuis la Révolution française jusqu'à nos jours" (3è vol. ); 3 / "Administrateurs et hommes scientifiques de l'Ariège" (4è vol. ); 4 / "Archéologues de l'Ariège": "Archéologues de l'Ariège, Tome 1er: Descripteurs du sol, géologues, historiens" (5è vol. ), "Archéologues de l'Ariège, Tome II: Suite des hommes scientifiques, orateurs, moralistes, pédagogues, publicistes, etc" (6è vol.) et "Archéologues de l'Ariège, Tome III: Suite et fin des hommes scientifiques - Compléments sur les hommes et les choses", avec index général (7è vol.). Illustré d'eaux - fortes de CHAUVET. Exemplaire bien complet des 7 volumes, complet du texte (dont 2 pages manquantes photocopiées), avec 74 planches (sur 86: manquent 12 planches dont 7 remplacées par des photocopies) et plus de 100 vignettes. HEIDI KANN BRAUCHEN, WAS ES GELERNT HAT. [Heidi Makes Use of What she has Learned.] Eine Geschichte fur kinder und auch fur solche, welche die kinder lieb haben. Original decorative cloth-covered boards, gilt. Patterned endpapers. 8vo. First edition. Some minor browning and staining here and there, else a very good copy of this scarce book. Also issued in pictorial paper-covered boards. Seebass II, 1930. 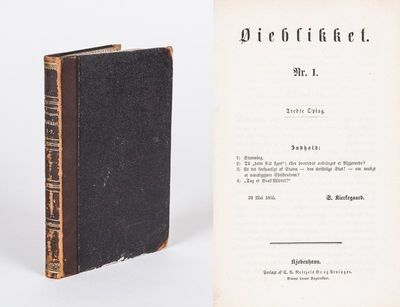 This title was published as a sequel to Heidi's Lehr - und Wanderjahre [Heidi's Years of Learning and Travel], 1880, and was the fifth part of the series Geschicten fur kinder wie auch fur solche, die kinder gern haben. San Diego. 1881.. Folding map, 23 1/2 x 34 3/4 inches, folded to 8 1/4 x 4 1/2 inches. Minor separations at crossfolds, a couple short fold separations, ink stamp on front, else very good. 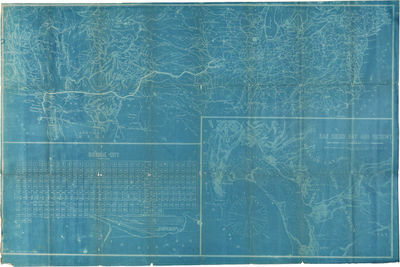 A rare blueprint map showing the harbor of San Diego, along with a scaled map of the U.S. from northern California, over to Boston, down to Charleston, South Carolina and over to Sonora, Mexico, and a grid of the property of the San Diego Land & Town Company in National City (a small city within San Diego) and including the "Terminal Grounds" of the railroad. Heliographed by O.N. Sanford in San Diego. Frank A. Kimball was the agent for California Southern or the San Diego Land and Town Company in National City, and the front cover bears his ink stamp. Rare, with only three copies on OCLC, at Yale, the University of California, San Diego, and the Sacramento Public Library. Not in Rocq. OCLC 54146621, 35291187, 34434276. Die fünfhundert Millionen der Begum. London Virtue and Co.,, [1881-84]. Edited by Colonel Wilson. Assited by the Most Eminent Palestine Explorers, etc. 4 volumes, quarto (317 × 242 mm). Contemporary black half morocco, blue cloth sides, raised bands, titles and decorations to compartments gilt, all edges red, marbled endpapers. Engraved frontispiece and title page to each volume, 34 similar plates, numerous wood engravings in the text, and 2 double-page maps. Boards gently rubbed, mild offsetting from plates, top edges stained, pale pink dampstain to top margin of the first few leaves of each volume, cloth of Volume I lightly cockled and creased. A very good set. First edition of one of the best illustrated nineteenth century accounts of the Middle East; Wilson (1836-1905) had detailed first hand knowledge of the region as first director of the Palestine Exploration Society. n.p., April 13, 1881. 4.75" x 2.5". 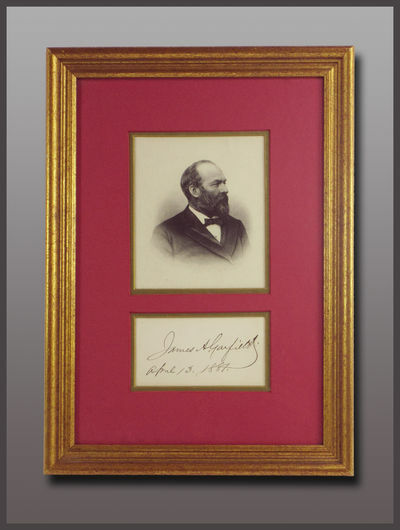 "His bold signature, ""James A. Garfield. April 13, 1881."" as President, on a 4.75"" x 2.5"" (visible) slip of paper. Minor contemporary ink smudge only slightly affects the last two letters of the signature, else very fine condition. Matted and framed with a engraved bust portrait of Garfield." Paris, Delahaye et Lecrosnier, 1881.. 24 x 17cm, zeitgen. Halbleder, leicht berieben, goldgeprägter Rückentitel, mehrere schwache Bibl.-Stempel, XVI, 640 S., 104 (von 105) Textabbildungen, 8 (von 9) ganzseitigen Ätzradierungen. Paul Richer (1849-1933) war lange Jahre Assistent von Charcot an der Salpetriere in Paris und gehört mit diesem zu den Entwicklern des Konzeptes der Hysterie. Hier liegt vor die seltene EA von 1881, aufgeteilt in vier Abschnitte: "De la grande attaque hysterique", "Des principales varietes de la grande attaque hysterique", "Etude clinique de quelques points relatifs aux symptomes permanents de l'hystero-epilepsie ou grande hysterie" und "Quelques considerations sur le diagnostic, le prognostic et le traitment de la grande hysterie". Hier finden sich auch die zahlreichen klassischen Abbildungen von Frauen (ausschließlich Frauen!!) mit "hysterischem Ausdrucksverhalten". Während dieser Hauptteil vollständig ist, fehlen vom Anhang "Notes historiques" die Seiten ab 640. Trotz dieses Mangels bedeutendes Dokument der Psychiatriegeschichte! Catalogue de tableaux anciens composant l'interessante collection de M. Roxard de la Salle (de Nancy) dont la vente aura lieu Hotel Drouot, salle 8, le Lundi 28 Mars 1881. Paris, Typ. Pillet et Dumoulin, o. J. (wohl 1881).. XVI (Vorwort PaulMantz), 24 S., mit 7 Original-Radierungen. 4° (Format ca. 28,2x19 cm, Halb-Maroquineinband der Zeit auf einigen falschen Bünden, goldgeprägter Rückentitelei und Kopfgoldschnitt.. Mit originalradierten, verkleinerten Wiedergaben (in der Imp. A. Salmon u.a. , die Stecher waren Champollion, Greux, ) von Gemälden von Camphuysen, Hals, Hooch, Neer, Ribera, Rubens, Vlieger. - In einem wunderschön ausgestatteten Halbmaroquineinband der Zeit, Meistereinband, signiert von Lanscelin, ev. auch mit einer handschriftlichen Widmung desselben auf dem fliegenden Vorsatzblatt! Verzeichnet insg. 67 Nummern (davon 5 Kunstbücher). - Die Kanten schwach angerieben, sonst sehr gut erhalten! - Precieux exemplaire de ce beau catalogue de vente orne de superbes 7 eaux fortes. - Demi-maroquin bleu de l'epoque a coins, dos a 5 nerfs orne, tete doree (reliure signee Lanscelin). Fine reliure de bonne facture, quelques infimes frottements d'usage. Interieur en tres bon etat de fraicheur. Ex-dono au crayon sur la garde (Lanscelin?). Precieux exemplaire de ce beau catalogue de vente orne de superbes eaux-fortes. Succession de M. Franc ois Nieuwenhuys, tableaux. Philadelphia, 1881. 8" x 10". "Mounted albumen photograph on a 8"" x 10"" mount, with embossed credit ""G. B. AYRES COPYRIGHT 1881"" stamped at both the left and right bottom corners. Signed on the verso ""Copyright Geo. B. Ayres Phila"" Ostendorf O-26. Some minor wear and abrasions to emulsion and mounting remnants well clear of Lincoln's portrait, overall very good. 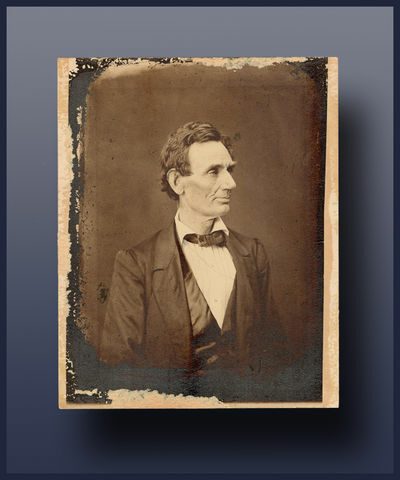 Chicago photographer Alexander Hesler was invited to photograph Lincoln in Springfield in June 1860 soon after his nomination for President at the Republican National Convention. During the sitting in the Old State House Hesler took three portraits. Lincoln remarked upon seeing the proofs, ?That looks better and expresses me better than I have ever seen; if it pleases the people I am satisfied.? This photograph is considered one of the finest ever taken of Lincoln. His law partner William Herndon noted of it, ?There is the peculiar curve of the lower lip, the lone mole on the right cheek, and a pose of the head so essentially Lincolnian; no other artist has ever caught it.? (Ostendorf O-26) Artist George B. Ayres acquired two of Hesler?s original negatives following the close of the Civil War and made a living selling prints of them from the 1880s through the turn of the century. Ayres? original interpositive for this image was broken in transit in the 1930s." London: Wh Allen, 1881. First . Hardcover. VG+. 8vo - over 7¾" - 9¾" tall. 3 volumes: 604, 557, and 839 pp, folding map. An eminently readable and long respected work by a noted scholar, historian and someone who makes this subject enoyable to learn about. A lovely set, partially uncut, in original VG+ gilt and blindstamped cloth bindings. Some wear and chipping at the bottom of vols 1 & 2, and the spine tips of the very thick vol 3 professionally strengthened. Considering that this is partially uncut, I doubt this was ever read as the volumes are very tight and fine inside. A lovely set. Special postage: US$20.00; foreign surface insured parcel post $50.00. Willis, E. B. & Stockton, P. K. Official Stenographers. DEBATES And PROCEEDINGS Of The CONSTITUTIONAL CONVENTION of the State of CALIFORNIA, Convened at the City of Sacramento, Saturday, September 28, 1878. Sacramento: J. D. Young, Supt. State Printing. 1880 - 1881. 3 volumes ( 640; , 641 - 1152; , 1153 - 1578) Text double column. Index concludes volume 3. This second Constitutional Convention of California revised the state Constitution to include an extended Bill of Rights, imposed [certain] restrictions on the power of the legislature, and dropped Spanish as the second legal language of the state. While certainly not a popular page-turner, this set represents the will of the people, and as such, offers a wealth of data to sociological researchers investigating the mid-to-late 19th C. "Far West" milieu. The set infrequently on the commerical market, with the last set at auction in 2000. Binding - Fine. Textblock - Overall VG (paper beginning to yellow/ex-lib, with the occasional oval stamp). Boston: Little, Brown and Company, 1881. First Edition. Hardcover. Very Good. 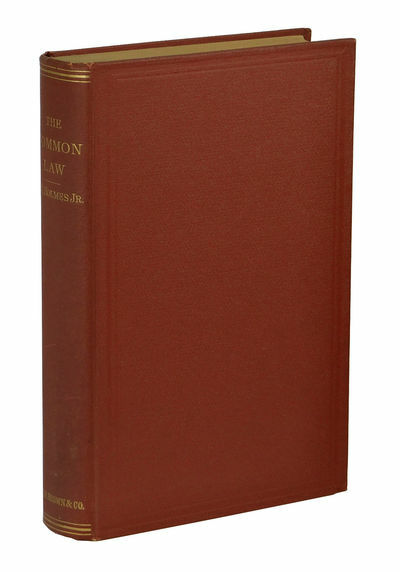 First Edition, First Printing, with "John Wilson & Son" listed as printer on verso of title page. In Near Fine condition. Spine slightly darkened, with gilt stamping dulled. Bump to bottom corners. Small ownership stamp to title page. Contents lightly toned. Lightly dust-soiled. A rather sharp copy. Paris: Jules Hetzel & A. Quantin, 1881. Fine. 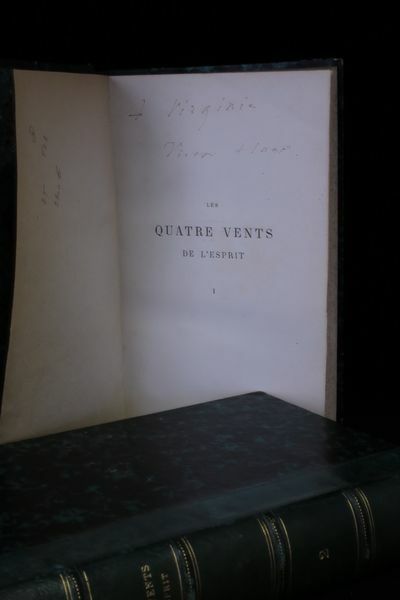 Jules Hetzel & A. Quantin, Paris 1881, 14,5x23cm, 2 volumes reliés. - First edition on current paper. Binders half sheepskin fir back with four nerves purposes set with ornate golden dotted double gilt, few traces of minor friction on the back, marbled paper plates, guards and contreplats paper to the tank, a small tear in foot of a slice, bottom corners bumped, bindings of the time. Precious autograph dedication signed by the author to her maid Virginia. Few minor foxing. --- Please note that the translation in english is done automatically, we apologize if the formulas are inaccurate. Contact us for any information! - [FRENCH VERSION FOLLOWS] Edition originale sur papier courant. Reliures en demi basane sapin, dos à quatre fins nerfs sertis de pointillés dorés ornés de doubles filets dorés, quelques petites traces de frottements sans gravité sur les dos, plats de papier marbré, gardes et contreplats de papier à la cuve, un petit accroc en pied d'une tranche, coins inférieurs émoussés, reliures de l'époque. 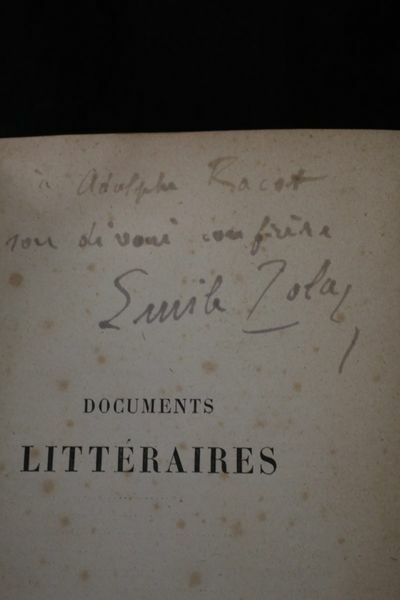 Précieux envoi autographe signé de Victor Hugo à sa cuisinière Virginie qui, à Guernesey, semblait assurer d'autres services au poète ainsi qu'en témoigne son carnet de l'époque: "Touché seins de Sophie, vu ceux de Constance (...) Charlotte, Cloche (...), Virginie, la Cuisinière, cloche; la femme de chambre, cloche". L'énigmatique annotation "cloche" signifierait selon Guillemin (cf. Hugo et la sexualité): "secouer la grosse cloche en branle", expression empruntée à sa pièce de théatre l'Epée. On ne sait si en 1881 l'ardeur du poète pour sa domestique était apaisée, Hugo étant réputé pour avoir poursuivi son oeuvre de séduction jusqu'à la fin de sa vie. Quelques petites rousseurs sans gravité. HAMBURG. "Deutsche Seewarte in Hamburg. Eröffnet von Sr. Majestät dem Deutschen Kaiser, Wilhelm I. am 14. September 1881". Blick zum Gebäude der Seewarte links auf einem Hügel, rechts der Hafen mit zahllosen Segel- und Dampfschiffen, Kutschen, Pferdewagen und viele Passanten im Vordergrund. - Lithographie mit Tonplatte von W. Heuer, 1881, 35 x 62 cm. Salamon S. 128, Ansicht 21. - Imposantes Panorama! Sehr breitrandig und tadellos erhalten. "Deutsche Seewarte in Hamburg. Eröffnet von Sr. Majestät dem Deutschen Kaiser, Wilhelm I. am 14. September 1881". Blick zum Gebäude der Seewarte links auf einem Hügel, rechts der Hafen mit zahllosen Segel- und Dampfschiffen, Kutschen, Pferdewagen und viele Passanten im Vordergrund.
. Lithographie mit Tonplatte von W. Heuer, 1881, 35 x 62 cm.. Salamon S. 128, Ansicht 21. - Imposantes Panorama! Sehr breitrandig und tadellos erhalten. La Iglesia de San Nicolás, su pasado y su presente . 1881. Editorial Juan E. Delmas. 1881 - Imp. Delmas. Bilbao. . 1 Vol. . 94 pp.+6 fot.+plano+diploma. Folio Menor. Cartoné. Audio-visuales (Fotografía), Siglo XIX , Vasco-Navarro (Bilbao), Vasco-Navarro (Imprenta Vasco-Navarra) . Bella y rara monografía histórica de la Iglesia de San Nicolás de Bilbao, escrita por Juan E. Delmas. Ilustrada con 6 fotografías albúminas de vistas panorámicas de iglesia y su entorno, 1 plano del Bilbao Medieval, 1 litografía de la fachada de San NIcolás y un diploma cromolitografíado con letra capitular historiada con la vista de San Nicolás. Es uno de los libros más bellos editados en el siglo XIX en Bilbao y una auténtica rareza bibliográfica. London: Chapman & Hall, 1881. First edition. vi,,  ; [viii], 246, [28, advertisements dated November 1880] pp. 2 vols. 8vo. 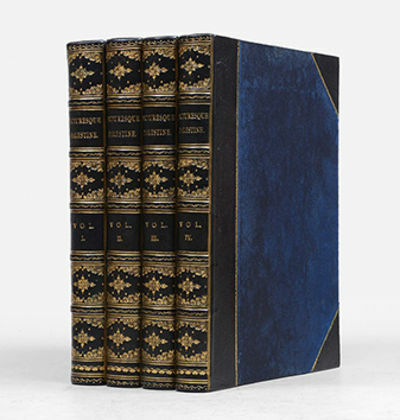 Bound in three quarter blue morocco and matching cloth sides, t.e.g., bookplate of Joseph Spencer Grayson. Spines sunned, very minor loss at front edges of firts several leaves of Volume One, else fine. First edition. vi,,  ; [viii], 246, [28, advertisements dated November 1880] pp. 2 vols. 8vo. "The Rev. Mr. Peacocke became vice-president of a college in St. Louis, Missouri. While there he befriended the deserted wife of Ferdinand Lefroy and after having verified, as he thought, a report of the man's death, married the widow. Soon after Lefroy returned, made himself known to them, but immediately disappeared again. Unable to trace him, the Peacockes left St. Louis and went to England. There they obtained positions in Dr. Wortle's school where they became very popular, Mrs. Peacocke as house-mother for the smaller boys, and Mr. Peacocke as an inspiring teacher. Stimulated by Mrs. Stantiloup, a woman who had been worsted by Dr. Wortle in a suit involving school fees, rumors arose that the past of the Peacockes would not bear investigation. The Bishop interfered and Dr. Wortle made inquiry of his teacher, whose story was sympathetically received. The same day Robert Lefroy, Ferdinand's brother, appeared at the school in an attempt at blackmail, but, finding that the story he had to tell was already known, admitted that his brother had since died. To obtain proof of this statement Mr. Peacocke induced Lefroy to accompany him to San Francisco, where he located Ferdinand's grave. On his return, Dr. Wortle performed another marriage ceremony, and the gossip gradually died down. Paris: Charpentier , 1881. Fine. Charpentier , Paris 1881, 12x19cm, relié. - Edition on current paper, mention of second edition. Binding to bradel half percaline khaki corners, flat spine, initials and dates golden tail, flat marbled paper wrappers preserved and bound in, contemporary binding signed by Paul Vié. 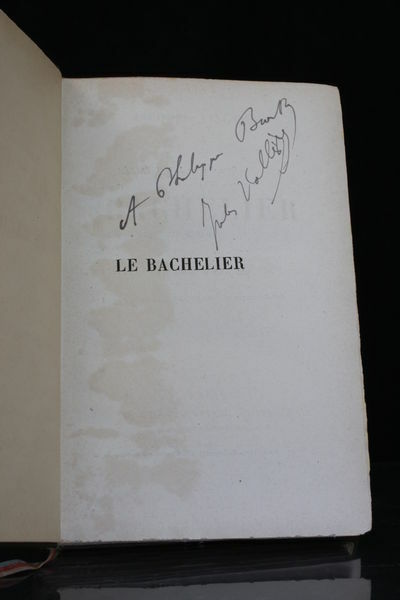 Precious autograph dedication from the author to the influential art critic Philippe Burty. Few foxing mainly affecting the margins. --- Please note that the translation in english is done automatically, we apologize if the formulas are inaccurate. Contact us for any information! - [FRENCH VERSION FOLLOWS] Edition originale sur papier courant, mention de deuxième édition. Reliure à la bradel en demi percaline kaki à coins, dos lisse, initiales et date dorées en queue, plats de papier marbré, couvertures conservées, reliure de l'époque signée de Paul Vié. Précieux envoi autographe de l'auteur à l'influent critique d'art Philippe Burty. Rares rousseurs affectant essentiellement les marges. 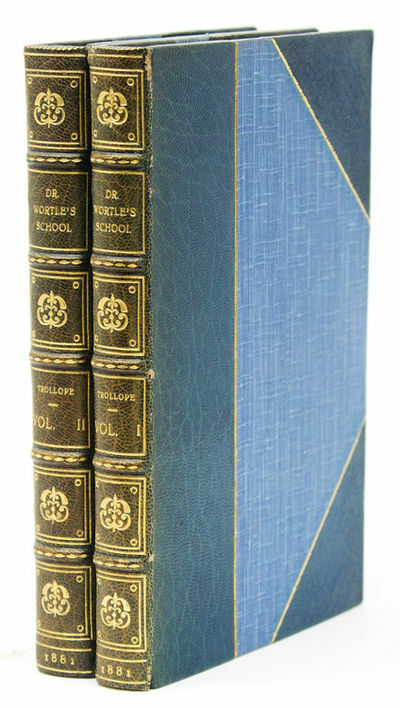 John Murray, 1881, Decorative Cloth, Book Condition: Very Good Minus, Second EditionSize: 8vo - over 7Â¾" - 9Â¾" tall, Presumed first printing of the second English edition. 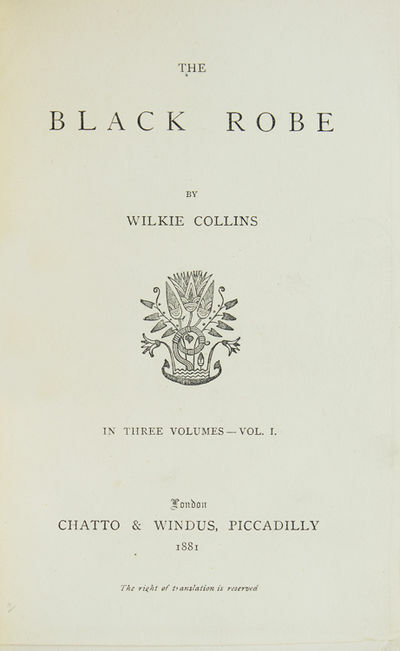 First edition believed to have been issued as two separate volumes. This copy is two volumes in one. 8 x 5. Deep spruce blue-green buckram binding with black-stamped decoration and lettering to the front board, gilt-stamped image of an Arab astride a camel to the front board, and with gilt-stamped lettering to the spine. Professionally relined spine and with text block recased with the original binding. Expert repair to spine head and tail using dyed linen. Unbumped spine head and tail, and with moderately bumped and scuffed corners. Text block firmly bound in. A.E.G. With xxxi and 273 and ix and 283 numbered pages. Illustrated with approximately 31 B&W plates [steel engravings? ], several of which are full-page. Also with a pedigree chart of the Ibn Saouds of Nejd and with a color fold-out map of Northern Arabia, as called for. The map with light foxing but otherwise in excellent condition. The book's preliminaries with evident foxing and the book with occasional scattered light foxing throughout. Handsome bookplate of previous owner to the front pastedown. Else an impressively clean copy inside and out. A Very Good Minus copy. Lady Anne Blunt was the wife of Wilfred Scawen Blunt and the grand-daughter of Lord Byron. Although hardly Byron's equal as a writer, her prose somwhat turgid, she nevertheless enjoyed popularity on account of the travel writing she and her husband did based on their travels in the Near East. Lady Anne was one of the most level-headed of all women travelers. To find out how the Bedouin lived, she lived like one herself: she became a temporary nomad, riding the two thousand miles from the Mediterranean to the Persian Gulf for the most part in Arab dress, and without guides. She and her husband were trusted and accepted by the Bedouin. Indeed, the Amir himself presented them with his choicest brood mares to take home for their famous Crabbet Arabian Stud. Broemel, Francis / Hoffmann, Hans / Oberländer, Richard. Nordland-Fahrten [Nordlandfahrten / Nordland=Fahrten]. Band I: Malerische Wanderungen durch Norwegen, Schweden, Irland und Schottland / Band II: Malerische Wanderungen durch England und Wales / Band III: Malerische Wanderungen durch England und die Kanalinseln / Band IV: Malerische Wanderungen durch Holland und Dänemark. Illustriert durch viele Holzschnitte nach Originalzeichnungen der bewährten Künstler. Leipzig, Ferdinand Hirt & Sohn, [1881 - 1882].. Vier Bände (vollständig). Folio. 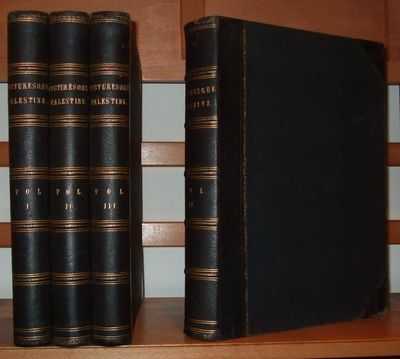 VIII, 192 / VIII, 238,  / VIII, 240 / IV, 228 Seiten / pages. Original Hardcover. Sehr dekorative, reich und aufwendig verzierte Ganzleinenbände. Excellent condition with only minor signs of external wear. / Außergewöhnlich gut erhaltene Ausgabe. In diesem Zustand ein wunderbares Erlebnis und ganz selten !. With 31 views of Norway, 6 views of Sweden, 34 illustrations of Ireland, 38 views of Scotland (With a beautiful Steelengraving of Edinburgh "From Calton Hill"). The second volume has 101 views of England and 40 of Wales. The third volume contains112 views of England and 19 illustrations on the Channel Islands. The fourth volume has 53 views of Holland and 29 views of Denmark. Mon oncle Benjamin. Nouvelle edition illustree de dessins de Sahib. Preface par Monselet. Nordland-Fahrten [Nordlandfahrten / Nordland=Fahrten]. Band I: Malerische Wanderungen durch Norwegen, Schweden, Irland und Schottland / Band II: Malerische Wanderungen durch England und Wales / Band III: Malerische Wanderungen durch England und die Kanalinseln / Band IV: Malerische Wanderungen durch Holland und Dänemark Illustriert durch viele Holzschnitte nach Originalzeichnungen der bewÃ¤hrten KÃ¼nstler. Leipzig: Ferdinand Hirt & Sohn. Excellent condition with only minor signs of external wear. / Außergewöhnlich gut erhaltene Ausgabe. In diesem Zustand ein wunderbares Erlebnis und ganz selten !. Vier Bände (vollständig). Leipzig, Ferdinand Hirt & Sohn, [1881 - 1882]. Folio. VIII, 192 / VIII, 238,  / VIII, 240 / IV, 228 Seiten / pages. Original Hardcover. Sehr dekorative, reich und aufwendig verzierte Ganzleinenbände. Excellent condition with only minor signs of external wear. / Außergewöhnlich gut erhaltene Ausgabe. In diesem Zustand ein wunderbares Erlebnis und ganz selten ! With 31 views of Norway, 6 views of Sweden, 34 illustrations of Ireland, 38 views of Scotland (With a beautiful Steelengraving of Edinburgh "From Calton Hill"). The second volume has 101 views of England and 40 of Wales. The third volume contains112 views of England and 19 illustrations on the Channel Islands. The fourth volume has 53 views of Holland and 29 views of Denmark. London, 1881. London, 1881-1882. Collegiate album amicorum containing 37 pages of manuscript contributions, mostly watercolours and ink drawings and featuring several nautical scenes, some creative writings, and one photograph. Presented to Harold Newton, graduate of Borough Road Training College, whom would become a teacher at the college the following year. With illuminated dedication page dated and inscribed by the presenter, and also with an autograph page signed in the original by 8 faculty members and 3 fellow graduates. 8vo. maroon calf binding, gilt tooling, five raised bands, original marbled endpapers. Volume measures approximately 19.5 x 24.5 cm. Wear to boards, mainly to extremities and spine, otherwise very good condition, a delightful reminiscence of Victorian and Edwardian England. Three masted barques, schooners, private sailing vessels and fishing boats, navigating rough waters, serenely coasting, or laying in waiting on a cliff flanked shore, hand drawn and colourful painted scenes whisk the viewer into the seafaring life of old England. Cottage homes, rural villages, and iconic characters complete the visual journey into the past, a reminiscence which begins, for Harold Newton, with his time as a student at the pioneering Borough Road College in Southwark. The comprehensive acquisition of 11 signatures from the college's principal, masters, tutors, and the like, suggest that the dedicatee was well respected. Having graduated in April 1882, Harold Newton was subsequently appointed a teacher and assistant master in January 1883. [Seven signatures of the institution's eight teachers at the time are included.] The volume is also inscribed by 58 fellow students, forming a register of names and residences, and illustrating that students came from vast regions of England and Wales. A few highlights of this journal include the following: • A beautiful watercolour of Robin Hood? 's Bay, a small fishing village and a bay located within the North York Moors National Park, five miles south of Whitby • Seven unique sailing vessel scenes • A three-mast schooner drawn in ink and signed, "With best wishes, Sincerely, John Opie. 2.6.82." The artist's signature and address, Four Lanes, Redruth [county of Cornwall], is found on the list of fellow students. Further research may find him to be a descendant or relation of English revered painter John Opie (1761-1807) of the neighbouring village of Trevellas, Cornwall. • A sketch drawing of an upper class woman, signed "London, 23 Juillet 1888, Henri de Woestyne." The artist may be a relation of famous Belgian expressionist artist Gustave Van de Woestyne (1881-1947) who belonged to the "First Group of Latem", a collective of artists who worked in Sint-Martens-Latem on the banks of the Lys, near Ghent. • A lovely watercolour rendition of Hammersmith features the original Hammersmith Bridge built in 1827 and the Lyric Opera House which was built on Bradmore Grove in 1888. • Comrades write farewell poems and verses of their college experience and the most memorable characters. Continued contributions to the volume, dating up to 1913. These all being hand sketched drawings or paintings, suggest that Harold Newton travelled in artistic circles. Originating as Joseph Lancaster's School in 1798, Borough Road College, an associated teacher training institute, moved to Borough Road in Southwark in 1804. In 1889 the College moved to Isleworth in west London. As part of the British and Foreign School Society (BFSS), in the 19th century it supported free British Schools and teacher training, and was an important development in the provision of universal free education for children. The Society was founded by Joseph Fox, William Allen and Samuel Whitbread. It was supported by several evangelical and non-conformist Christians, including William Wilberforce. In 1975, Borough Road College merged with Maria Grey Training College to form the West London Institute of Higher Education. Following a subsequent merger with Brunel in 1995, the site became the University's Osterley campus. The site was sold in 2006 with remaining staff and students relocating to Uxbridge. In the 1881-1882 term there were 127 students in residence at Borough Road College. 65 first year students, 64 second year students. The teaching staff consisted of eight male professors, as follows: J. Curtis (principal), George E. Buckle (head master / master of method), A.W. Ward (mathematical lecturer), Edwin Barkby (tutor), Andrew Telfer (assistant tutor), J. Bertenshaw (assistant tutor), James Mills (assistant tutor), and J. Sully (lecturer on mental science). With exception of only Sully, all of the aforementioned have signed this volume in the original! Additional signatures include: Alfred Bourne (secretary at the Society's House), William George Constable (assistant master), Thomas Handel Bertenshaw (fellow graduate, B.A. ), Alfred Smith, and William Williams. . Very Good. London: Chatto and Windus, 1881., 1881. 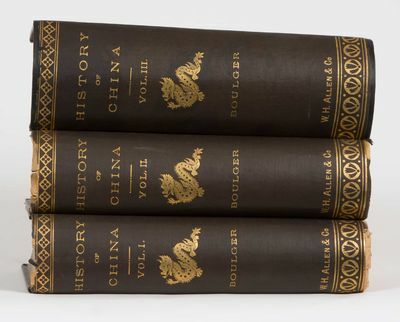 4 volumes; large 8vo. Contemporary binding by J. Low in full green morocco with gilt titles and extra gilt to spines, gilt rule to boards with the emblem of the Law Society stamped in gilt to centre of uppers, marbled end papers, all edges gilt. Prize label from the Law Society dated 1893 to paste down of vol.I. A fine and very attractive set. Blick auf Venedig von S. Giorgio aus. 09. [Signierte Original-Radierung / signed original etching].
. Carl Theodor Thiemann, geboren am 10. November 1881 in Karlsbad, Österreich-Ungarn; gestorben am 3. Dezember 1966 in Deutenhofen.. Original-Radierung auf Büttenpapier. Von Carl Thiemann in Blei beschriftet, signiert und datiert (09). Maße Blatt: 39,6 x 63,0 cm. Maße Abbildung: 22,0 x 49,0 cm. Blatt im Außenbereich fleckig, angestaubt, geringe Randläsuren. Gutes Exemplar. Original-etching on handmade paper. Labeled, dated and signed by Carl Thiemann. Measure sheet: 39,6 x 63,0 cm. Measure image: 22,0 x 49,0 cm. Sheet at the border area spotted, light edgewears. Good condition. The Imperial Gazetteer of India. London, Trübner & Co., 1881.. 8 vols. (instead of 9, lacking vol. 1). Modern green library cloth. (With): The same, New Edition. Oxford, Clarendon Press, 1908-1909. 16 vols. (instead of 25, lacking vols. 1 through 9). Publisher's original cloth. A total of 24 volumes; numerous maps.. A torso of the first edition of this famous geographical directory of the British Indian Empire, and of the posthumous 1908 "New Edition". The Scottish historian and statistician Hunter, a member of the Indian Civil Service, is best remembered for having compiled the present work of reference work, which he first conceived in 1859. The first edition was published in nine volumes in 1881 (a second edition, augmented to fourteen volumes, was issued in the years 1885-87). After Hunter's death in 1900, Herbert Hope Risley, William Stevenson Meyer, Sir Richard Burn and James Sutherland Cotton compiled the twenty-six volume New Edition, which consisted of four encyclopedic volumes covering the geography, history, economics, and administration of India, 20 volumes of the alphabetically arranged gazetteer, listing places' names and giving statistics and summary information, and one volume comprising the index and atlas. - Removed from the Bradford Free Library (1881 ed.) and the British Library - Lending Division (1908 ed.) with markings as usual. Occasional insignificant spine wear; well-preserved in all.
. General Karte von Bosnien und der Hercegovina im Masstabe 1 : 150.000 d. N. Aus den Catastral Aufnahmen und den Terrainskizzen der Geometer reducirt und gezeichnet von den Unterdirektoren der Vermessungs-Abtheilungen. Redigirt von der Vermessungs-Direktion in den Jahren 1881-84. Herausgegeben als provisorischer Behelf vom k.k. Militär-geographischen Institute 1884-1885. Wien, Photolithographie d. k.k. Militär geograf. Institutes. Mit 1 Übersichts-Blatt u. 18 farb. Karten-Blätter (a 36 x 55 cm) zu je 8 Segmenten auf Lwd. aufgezogen, in HLdr.-Schuber d. Zt. mit Rtit. - wir garantieren für die Echtheit. Seltene großformatige Karte.- Lwd.-Rückseite etw. fleckig, sonst schönes Exemplar.# Rare large-format map in 19 sheets (a 36 x 55 cm), each in 8 dissected panels mounted on canvas, folded and housed in a original half leather slipcase.